The Rio Mamoni is another significant river flowing through the territory of Panama. For interested rafters looking for newer and unexplored destinations to raft on, this waterway is surely a popular address. With turbulent waves of Class III & IV, this river happens to be quite a challenging one, especially to the beginners. As you paddle down the Rio Mamoni, you can feel the amazing strength of the tumultuous waves passing beneath your raft. Swaying through the incredible torrents, you will need to encounter high-rising whitewater and frothy waves all through the trip. Subsequently, the rafting zone is spotted with several huge boulders as well. As the river moves amidst steep canyon walls featuring enticing cascades, you will surely be mesmerized by the startling beauty of the river. Rio Mamoni drifts through dense forests and lush vegetation, which is again the home to several animals including monkeys, crocodiles and numerous varieties of birds. With breathtaking scenery and stunning torrents, the river is indeed a perfect rafting zone. While you plan for a rafting expedition on the Rio Mamoni, remember to take along the requisite essentials in your trip. Along with the rafting gears and wetsuits, don’t forget to carry some items for having breakfast and lunch! Some drinking water will also keep you filled and hydrated all through the trip. To get a better taste of the tantalizing rafting adventure, you can surely seek the help of guides to direct you through the fascinating waters. So, pack your bags and get prepared to jump into the captivating waters of Rio Mamoni. Enjoy the fun ride on the astounding water body and cherish the beautiful memories forever! For other rivers in this region consider the Rio Chiriqui Viejo flows through the Panama and Costa Rican border. 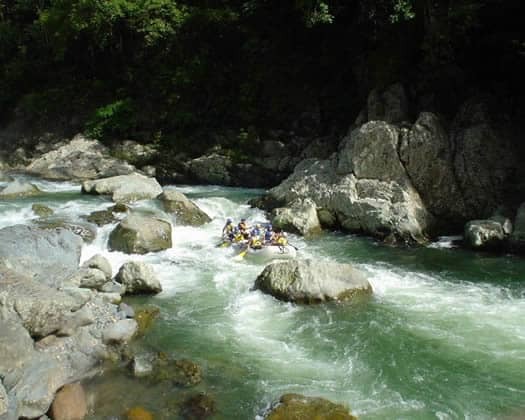 Considered as one of the best rivers in the world in the arena of whitewater rafting.